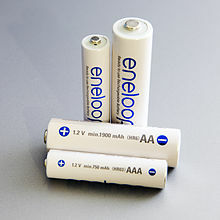 A nickel–metal hydride battery, abbreviated NiMH or Ni–MH, is a teep o rechairgeable battery. The chemical reaction at the positive electrode is seemilar tae that o the nickel–cadmium cell (NiCd), wi baith uisin nickel oxide hydroxide (NiOOH). Houiver, the negative electrodes uise a hydrogen-absorbing alloy insteid o cadmium. A NiMH battery can hae twa tae three times the capacity o an equivalent size NiCd an its energy density can approach that o a lithium-ion battery.